New Knapps Meadow assistant site manager Adam Elvin is still winning prizes for his work during his three-year apprenticeship with Bovis Homes South West region, which ended in the summer with a promotion to a full-time role. 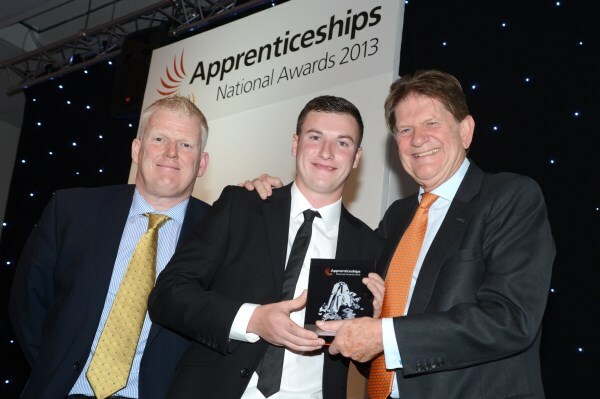 The 21-year-old Bristolian beat off competition from thousands of other apprentices across Berkshire, Buckinghamshire, Oxfordshire and Gloucestershire to win a Highly Commended award at the regional final of the prestigious National Apprenticeship Awards 2013, held at the Madejski Stadium, Reading. Adam was the only apprentice from a housebuilder to make it through to the finals and this latest milestone comes at the end of an apprenticeship working at Bovis Homes developments across Bristol, in conjunction with city council organisation On Site Bristol. The Thames Valley region has an estimated 50,000 apprentices and the event featured representatives from some of the country's biggest companies, including Cisco, Telefónica and Virgin Media. The National Apprenticeship Awards, now in their 10th year, celebrate the achievements of the country's most outstanding apprentices and apprenticeship employers. "The Thames Valley final of the National Apprenticeship Awards was a fantastic evening of celebration, and a brilliant opportunity to recognise the high calibre of apprentices and employers in our region. "I would like to take this opportunity to congratulate all the exceptional individuals and employers who had such inspiring stories to tell. Apprenticeships allow employers to grow their own talent, and allow apprentices to earn while they learn and build real careers and bright futures. All our finalists are testament to this."